The One Hundred Fourteenth United States Congress was a meeting of the legislative branch of the United States federal government, composed of the United States Senate and the United States House of Representatives. It met in Washington, D.C. from January 3, 2015, to January 3, 2017, during the final two full years of Barack Obama's presidency. The 2014 elections gave the Republicans control of the Senate (and control of both houses of Congress) for the first time since the 109th Congress. 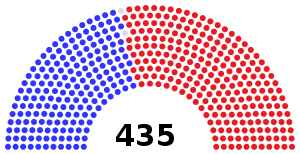 With 248 seats in the House of Representatives and 54 seats in the Senate, this Congress began with the largest Republican majority since the 71st Congress of 1929–1931. Pope Francis addressed Congress September 24, 2015. 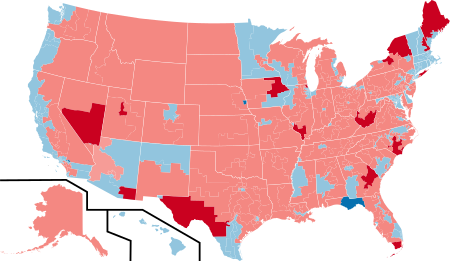 January 6, 2015: Incumbent Speaker of the House John Boehner was re-elected even though several members of his own party once again chose not to vote for him. He received 216 votes, a majority of the votes cast, but two votes shy of a majority of the full membership. 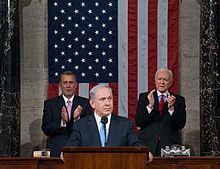 March 3, 2015: Prime Minister of Israel Benjamin Netanyahu addressed a joint session of Congress regarding sanctions against Iran. Netanyahu was invited by Speaker John Boehner without consulting President Obama. March 9, 2015: U.S. Senator Tom Cotton wrote and sent a letter to the leadership of the Islamic Republic of Iran, signed by 47 of the Senate's 54 Republicans, attempting to cast doubt on the Obama administration's authority to engage in nuclear-proliferation negotiations with Iran. March 25, 2015: Afghanistan President Ashraf Ghani addressed a joint session of Congress. April 29, 2015: Japanese Prime Minister Shinzō Abe addressed a joint session of Congress, becoming the first Japanese leader to do so. 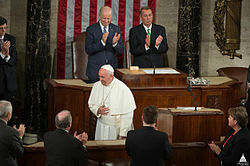 September 24, 2015: Pope Francis addressed a joint session of Congress, becoming the first Pope to do so. September 25, 2015: House Speaker John Boehner announced that he would resign as Speaker and from the House at the end of October 2015. Subsequently, Majority Leader Kevin McCarthy, the presumptive favorite to succeed John Boehner, unexpectedly withdrew his candidacy for the job. October 29, 2015: Paul Ryan was elected to succeed John Boehner as Speaker of the House receiving 236 votes (of 432 votes cast). He is the youngest Speaker since James G. Blaine in 1869. June 8, 2016: Indian Prime Minister Narendra Modi addressed a joint session of Congress. June 22–23, 2016: In the wake of the 2016 Orlando attacks, Congress debated gun control reform. The U.S. House recessed for the July 4 holiday during a sit-in protest held by Democrats that halted business in the chamber for more than 24 hours. 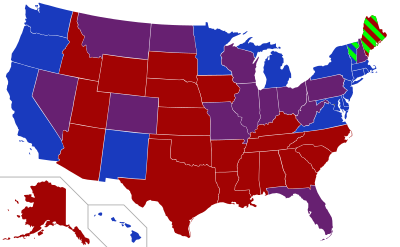 November 8, 2016: Donald Trump and Mike Pence elected as president and vice-president in presidential elections, while the Republicans retain majority at both Senate and House of Representatives. 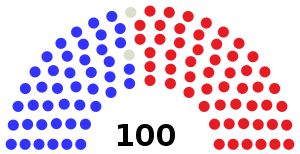 Senators are listed by state and then by Senate classes, In this Congress, Class 3 meant their term ended with this Congress, requiring re-election in 2016; Class 1 meant their term began in the last Congress, requiring re-election in 2018; and Class 2 meant their term began in this Congress, requiring re-election in 2020. Composition of the House by district (2014 election results). 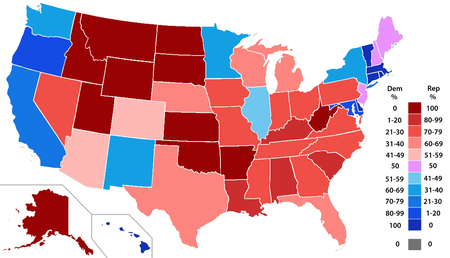 Bright red are pick-ups by Republicans, bright blue are pick-ups by Democrats. (R) Incumbent resigned January 5, 2015, following a guilty plea on one count of felony tax evasion. (R) Incumbent died February 6, 2015. (R) Incumbent resigned March 31, 2015, following a spending scandal. (R) Incumbent resigned October 31, 2015. (D) Incumbent resigned June 23, 2016, following a conviction of corruption charges. (D) Incumbent died July 20, 2016. (R) Incumbent resigned September 6, 2016, following an ethics investigation. (D) Incumbent resigned December 4, 2016, to become a member of the Los Angeles County Board of Supervisors. (R) Incumbent resigned December 31, 2016, to become Macomb County Public Works Commissioner. No special election was held and the seat remained vacant until the next Congress. Miller did not run for re-election in 2016. [Section contents: Senate, House, Joint ] Listed alphabetically by chamber, including Chairman and Ranking Member. Source: "Senate Organization Chart for the 114th Congress". Senate.gov. US Senate. Archived from the original on March 28, 2015. Retrieved January 26, 2015. Source: "Officers and Organizations of the House". House.gov. US House. Retrieved January 26, 2015. ^ Rep. Michael Grimm (R-New York's 11th district) resigned January 5, 2015. ^ Rep. Alan Nunnelee (R-Mississippi's 1st district) died February 6, 2015. ^ Rep. Aaron Schock (R-Illinois's 18th district) resigned March 31, 2015. ^ Rep. Dan Donovan (R-New York's 11th district) was elected May 5, 2015. ^ Rep. Trent Kelly (R-Mississippi's 1st district) was elected June 2, 2015. ^ Rep. Darin Lahood (R-Illinois's 18th district) was elected September 10, 2015. ^ Rep. John Boehner (R-Ohio's 8th district) resigned October 31, 2015. ^ Rep. Warren Davidson (R-Ohio's 8th district) was elected June 7, 2016. ^ Rep. Chaka Fattah (D-Pennsylvania's 2nd district) resigned June 23, 2016. ^ Rep. Mark Takai (D-Hawaii's 1st district) died July 20, 2016. ^ Rep. Ed Whitfield (R-Kentucky's 1st district) resigned September 6, 2016. ^ Reps. Dwight Evans (D-Pennsylvania's 2nd district), Colleen Hanabusa (D-Hawaii's 1st district), and James Comer (R-Kentucky's 1st district) were elected November 8, 2016. ^ Rep. Janice Hahn (D-California's 44th district) resigned December 4, 2016. ^ Rep. Candice Miller (R-Michigan's 10th district) resigned December 31, 2016. ^ a b Senators King (ME) and Sanders (VT) have no political affiliation but caucus with the Democratic Party. ^ Sablan caucuses with the Democratic Party. ^ Like many members of the PNP, Pedro Pierluisi affiliates with both the PNP and the Democratic Party. ^ H.J.Res. 129: "Appointing the day for the convening of the first session of the One Hundred Fourteenth Congress." ^ a b H.Con.Res. 104: "Providing for the sine die adjournment of the first session of the One Hundred Fourteenth Congress." ^ Walsh, Deirdre (January 6, 2015). "Boehner Overcomes Big Opposition to Remain Speaker". CNN. Retrieved January 7, 2015. ^ a b Heitshusen, Valerie; Beth, Richard S. (January 4, 2019). "Speakers of the House: Elections, 1913–2019" (PDF). CRS Report for Congress. Washington, D.C.: Congressional Research Service, the Library of Congress. Retrieved January 31, 2019. ^ Bradner, Eric (January 25, 2015). "Criticism over Netanyahu visit intensifies". CNN. Retrieved January 26, 2015. ^ Lee, Carol; Solomon, Jay (March 3, 2015). "Israel's Netanyahu Urges Congress to Block 'Bad Deal' With Iran". The Wall Street Journal. New York. Retrieved March 3, 2015. ^ Baker, Peter (March 9, 2015). "Angry White House and G.O.P. Senators Clash Over Letter to Iran". The New York Times. Retrieved March 16, 2015. ^ Riechmann, Deb (March 26, 2015) - "In U.S., Ghani Vows Afghan Self-Reliance". Northwest Arkansas Democrat-Gazette. Retrieved March 27, 2015. Archived March 30, 2015. ^ a b Zengerle, Patricia (March 26, 2015). "Japan PM Abe to Address Joint Session of Congress". Reuters. Retrieved March 27, 2015. ^ Mauldin, William (April 29, 2015). "Japan Prime Minister Shinzo Abe Argues for Trade Deal in Speech to Congress". The Wall Street Journal. Retrieved April 29, 2015. ^ Sherman, Jake (February 5, 2015). "Pope will address Congress in September". Retrieved April 29, 2015. ^ Steinhauer, Jennifer (September 25, 2015). "John Boehner Will Resign From Congress". The New York Times. ^ "Shock! McCarthy drops Speaker bid". The Hill. October 8, 2015. Retrieved May 15, 2016. ^ Richard Escobedo (November 1, 2015). "Who was the last House speaker younger than Paul Ryan?". CBS News. ^ Siegel, Ben (June 23, 2016). 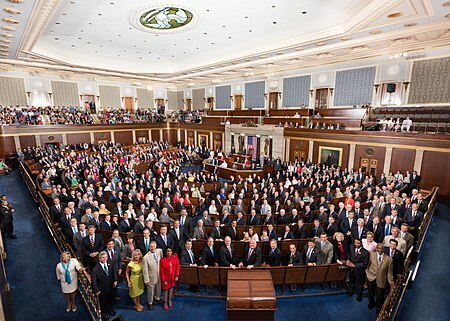 "Congress adjourns fight for gun control to July 5th". Yahoo. Politics. Retrieved June 23, 2016. ^ a b c d e Lesniewski, Niels; Dennis, Steven (November 13, 2014). "Mitch McConnell Unanimously Elected Majority Leader by GOP". Roll Call. Retrieved February 2, 2015. ^ a b c d e f g Sanchez, Humberto; Lesniewski, Niels (November 13, 2014). "Harry Reid Unveils New Leadership Team, Strategy". Roll Call. Retrieved February 2, 2015. ^ "Caucus Memberships of Gregorio Sablan". House.gov. US House of Representatives. Retrieved January 25, 2015. ^ "Boehner Commends Grimm for Announcing Resignation" Roll Call, December 30, 2014. ^ "Welcome to New York's Sixth Special Election in Six Years" Roll Call, January 2, 2015. ^ "GOP Rep. Nunnelee of Miss. Dies After Brain Cancer, Stroke" ABC News, February 6, 2015. ^ Pender, Geoff (February 6, 2015). "Governor will set election after Nunnelee's death". The Clarion-Ledger. Retrieved February 19, 2015. ^ Cahn, Emily (May 12, 2015). "Mississippi Special Election Heads to Runoff". Roll Call. ^ Bash, Dana; Zeleny, Jeff; Jaffe, Alexandra (March 17, 2015). "Aaron Schock resigns amid scandal". CNN. Retrieved March 17, 2015. ^ DeBonis, Mike; Costa, Robert; Kane, Paul (March 17, 2015). "Rep. Aaron Schock announces resignation in wake of spending probe". The Washington Post. Retrieved March 17, 2015. ^ "Amid revolt, Boehner steps aside to avoid 'irreparable harm' to Congress". Usatoday.com. September 26, 2015. Retrieved May 15, 2016. ^ "Davidson will be sworn in today". Journal-News. June 9, 2016. ^ "Rep. Chaka Fattah resigns after conviction, effective immediately" (Press release). CBS. June 23, 2016. Retrieved June 23, 2016. ^ Brennan, Chris (July 1, 2016). "Special election for Fattah's former U.S. House seat will be Nov. 8". Philadelphia Media Network. Retrieved July 4, 2016. ^ Blair, Chad (July 20,2016). "Tributes Pour In After Death of Congressman Mark Takai." CivilBeat.org. Retrieved September 21, 2018. ^ "Rep. Whitfield to retire amid ethics probe". TheHill. ^ Wire, Sarah D. (November 29, 2016). "Rep. Janice Hahn to resign seat early to be sworn in as L.A. County supervisor." Los Angeles Times. Retrieved from LATimes.com, September 21, 2018. ^ Shabad, Rebecca (January 5, 2015). "Budget scorekeeper awaits GOP decision". The Hill. Archived from the original on March 28, 2015. Retrieved January 26, 2015. "Videos of House of Representatives Sessions for the 114th Congress from www.C-SPAN.org". "Videos of Senate Sessions for the 114th Congress from www.C-SPAN.org". "Videos of Committees from the House and Senate for the 114th Congress from www.C-SPAN.org". House of Representatives Session Calendar for the 114th Congress, 2015 calendar (PDF). Senate Session Calendar for the 114th Congress (PDF). Congressional Pictorial Directory for the 114th Congress (PDF). Official Congressional Directory for the 114th Congress (PDF).